Brutal Bastards! Israeli Settlers Stone To Death Palestinian Woman! A middle-aged Palestinian woman has been stoned to death by Israeli settlers in the northern part of the occupied West Bank, reports say. 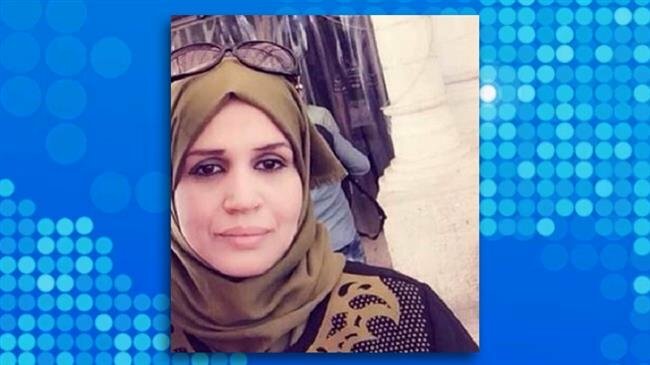 Aisha Mohammed Aravi, 47, (pic above) was driving in her vehicle along her husband near a West Bank checkpoint south of Nablus late on Friday when they came under attack by Israeli settlers who came onto the road and began throwing large stones at the couple’s car. According to local sources, the attackers broke the windshield of the car, hitting the couple multiple times in the head and upper body with a barrage of stones. Aisha, from Bidya town, lost her life on the scene due to blunt force trauma to the head caused. The reports said that Aisha’s husband also sustained moderate to severe injuries in the attack. Dozens of students were injured during the invasion, which also led to disruption of classes and material damage. Minutes after the incident, Israeli forces also entered the high school and provided protection for the settlers while escorting them out of the area. The troopers also fired rubber-coated steel bullets and tear-gas canisters at students, causing a number of them to suffer from tear-gas inhalation. Israel’s continued settlement expansion on Palestinian territories has been a major sticking point in Israeli-Palestinian talks, which have stalled since 2014. This entry was posted in News and politics and tagged Israeli settlers stone, Israelis enter high school, Nablus, Palestinian woman stoned, West Bank. Bookmark the permalink.